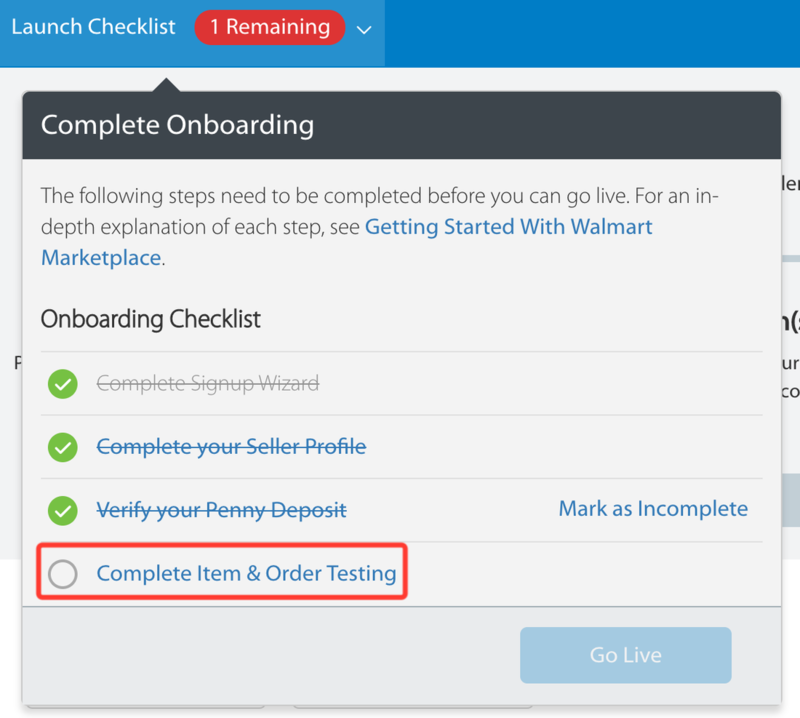 Once your SKUs are in your Walmart Portal (viewable in the Manage Items section), follow the steps below. Note: While completing your test orders, you are required to publish SKUs - These SKUs will actually be live on Walmart and available for purchase so we recommend temporarily reducing inventory in Zentail to 2 for the SKU(s) you publish. For accounts that have not yet completed the launch checklist it can take up to 24 hours for SKUs to be available to publish. We recommend enabling feeds and setting a single SKU to list to Walmart at least 24 hours before you plan to complete the order testing. After your catalog is fully set up enable your feed options for Walmart:Enable: Product Data, Inventory Sync, Order SyncMake sure the toggles are set to "Test Mode" and "Order Test Mode"
Click on the "Launch Checklist" => Click "Complete Item & Order Testing"
Follow these steps from Walmart's Knowledgebase. Note: While completing your test orders, you are required to publish SKUs - These SKUs will actually be live on Walmart and available for purchase so we recommend temporarily reducing inventory in Zentail to 2 for the SKU(s) you publish. How do I set Walmart Product Types for my SKUs? How do I connect my Zentail account with my Walmart account? What is the process for going live with Walmart Marketplace?